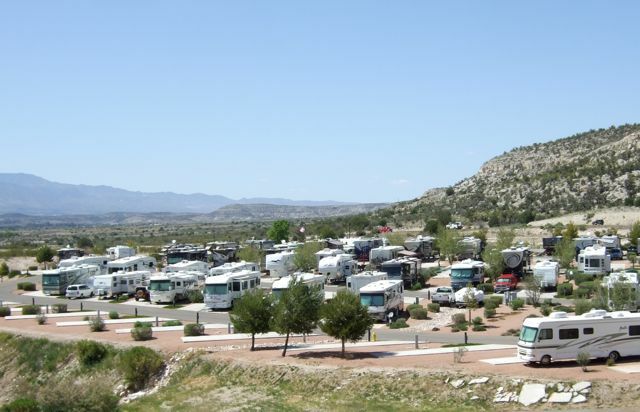 Here's where we've spent the last two nights: The Blake Ranch RV Park and Horse Motel, just east of Kingman, AZ. So far, we've only spotted RVs. No horses. But, we're here for another night. So, who knows? Our original plan was to stop here for a quick overnight. But, Mother Nature had other plans. Springtime in the deserts of Arizona and California can get mighty windy. And, so it is this week. We left Camp Verde bright and fairly early (for us, anyway) in hopes of beating the wind to Kingman. And, we did OK. By the time we pulled into the horse motel shortly after noon, the desert winds were beginning to blow. Since then, we've had wind, rain and even a snowflake or two. So, all we've done is sit in this comfortable and quiet spot just off I-40. Yesterday's forecast across the deserts was 60 mph winds, so we decided to sit in our comfy spot. And, today's forecast wasn't much better, so we continued to sit and wait. Tomorrow looks like a decent day to make the drive. 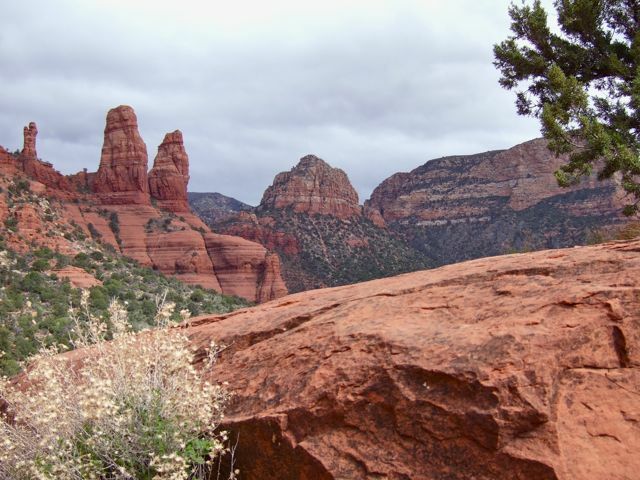 The forecast is calling for gusts in and around canyons. So, the climb up and over Tehachapi could be interesting. Our big moose is up for the challenge. Too bad the wind hasn't stopped howling since we arrived. This looks like a fun place to get out and explore. It's been a wonderful week here in Camp Verde. But, it's time for us to head out. 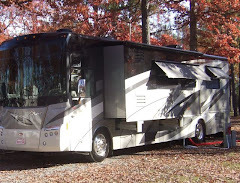 A regional gathering of Country Coach owners is getting started in our park, and one of these luxurious big rigs is slated to take our spot tomorrow. The place is filling up, and Bullwinkle is feeling a bit intimidated. It's definitely time to roll. 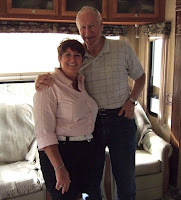 One of the highlights of our stay here was our visit with Linda and Denny. We've been following their online travel journal for a couple of the 12 years these two have been on the road. When we learned they were camped in nearby Cottonwood, we just had to stop by and say "Hi!" Our visit was far too short. (Our fault!) But, it was a real treat to get to meet these RV vagabonds and see their lovely new rolling home. We look forward to meeting up with them again and spending more time getting to know each other somewhere down the road. 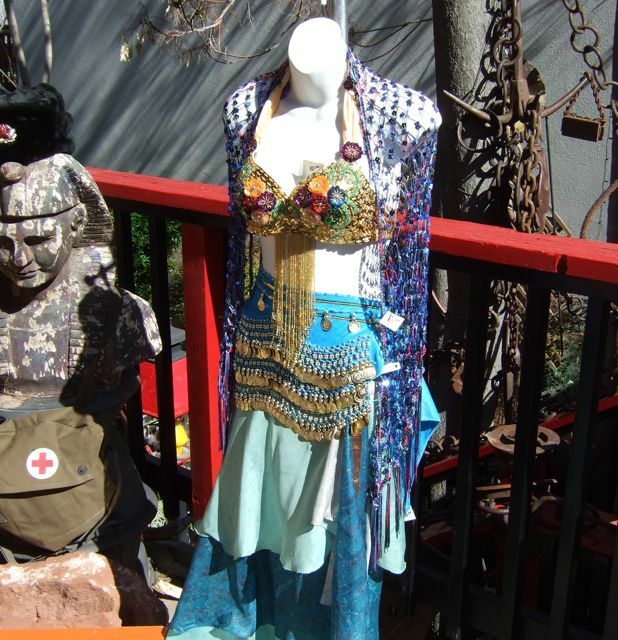 There is much more to see and do in the Verde Valley. And, we look forward to spending more time exploring this beautiful spot the next time we pass this way. 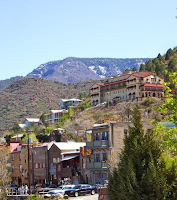 High atop Cleopatra Hill on the southern edge of the Verde Valley sits Jerome. 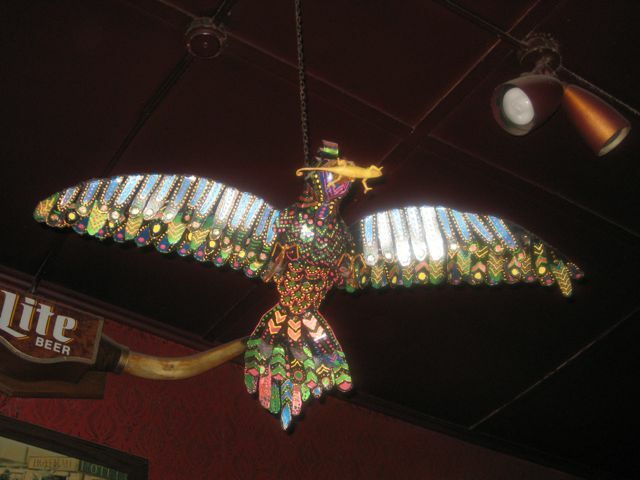 This old mining town with a rich history was once known as the "Wickedest Town in the West." The drive to Jerome is not for the faint of heart, much less a motorhome. (In fact, they're not allowed.) The road is steep, narrow and features more than a few tricky switchbacks. We did it in the Jeep, and it was definitely worth the ride. We made the trip with Jim and Ellie, who are staying in Dead Horse State Park. 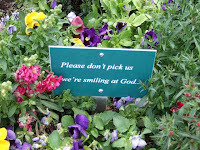 We checked out the park the other day with (another) Jim and Sandie and thought it was very nice. After stopping by to pick up Jim and Ellie this morning, we have Dead Horse at the top of our list of places to stay when we pass this way again. It was great to meet these fellow travelers and spend a fun day getting to know them. They're standing in front of the oldest buildings in Jerome: the old city jail. There's not much to it today, but according to a local that passed our way it survived a fire or two and a tumble down the hill to the spot where it now sits. 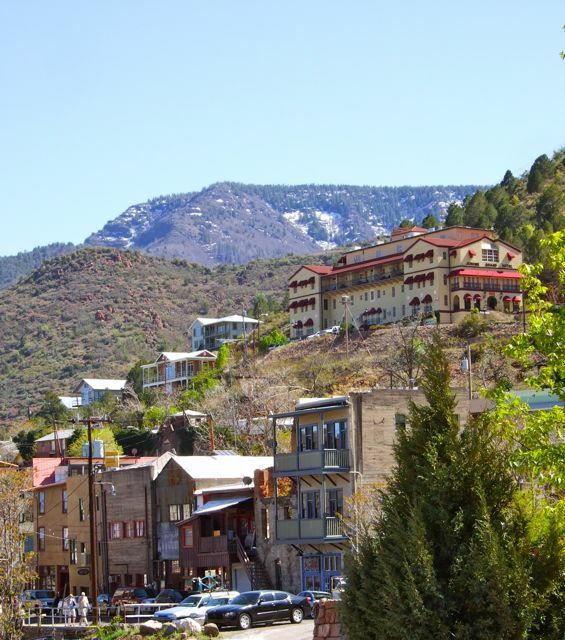 Jerome has evolved from it's wild, mining roots to a modern day tourist attraction and art destination. 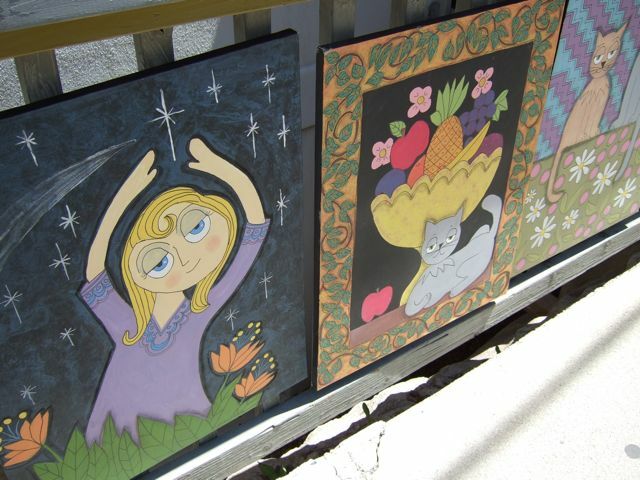 Many of the old buildings around town have been refurbished and our now home to elegant art galleries and quaint shops. We managed to poke our heads in a few places and enjoy the work of area artists. 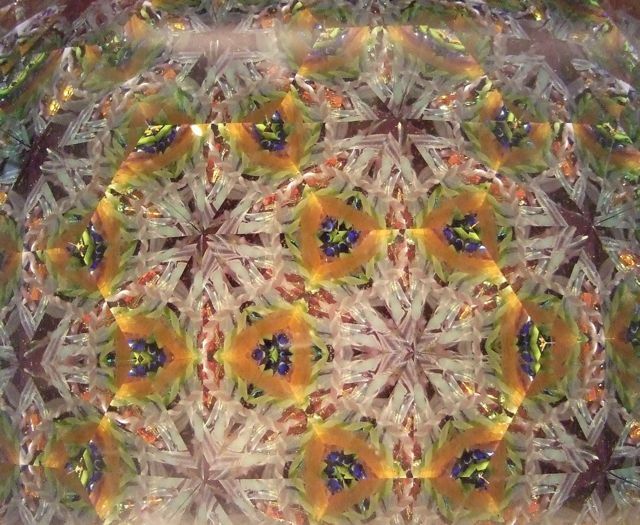 One store had an incredible display of kaleidoscopes. I wondered what would happen if I put the camera to the eyepiece of this one and snap. Here's the result! Cool, huh? 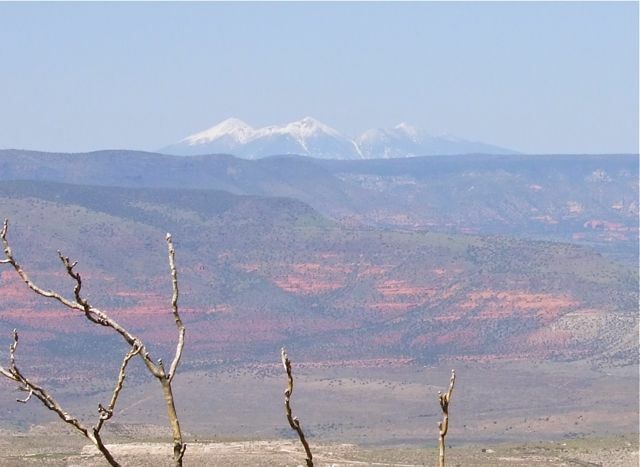 From Jerome, the view across the Verde Valley is spectacular. The snow-covered San Francisco Peaks are some 50 miles to the north, near Flagstaff. A much closer eye-catching landmark is the Douglas Mansion. 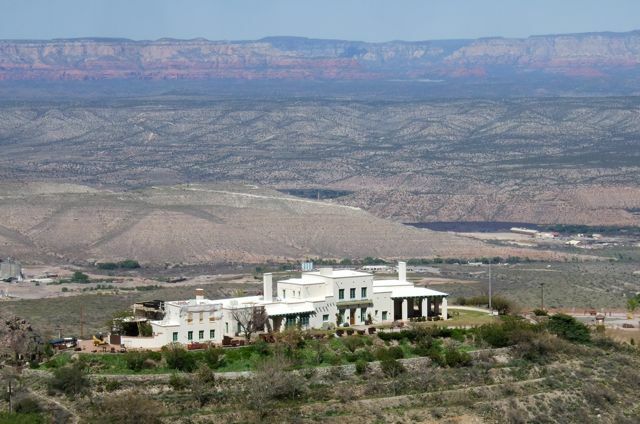 Built in 1916 by mining magnate James Douglas, this big house served as a hotel for mining officials and investors and was home to the Douglas family. 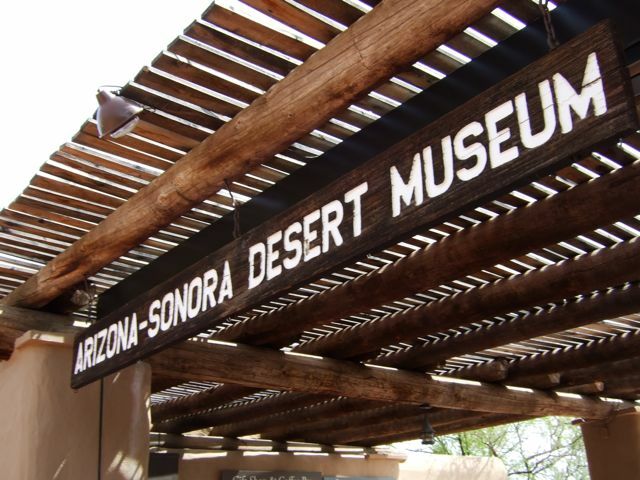 Today it sits on a state park and serves as a museum that chronicles Jerome's history. Unfortunately, Jerome Historic State Park is closed. Building repairs and budget cuts have kept the park off limits since February 2009. For now, the only way to appreciate this historic spot is the view from Jerome. 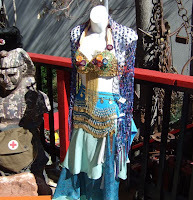 ...and, I found it hard to pass up this exquisite couture. But, somehow, we managed! 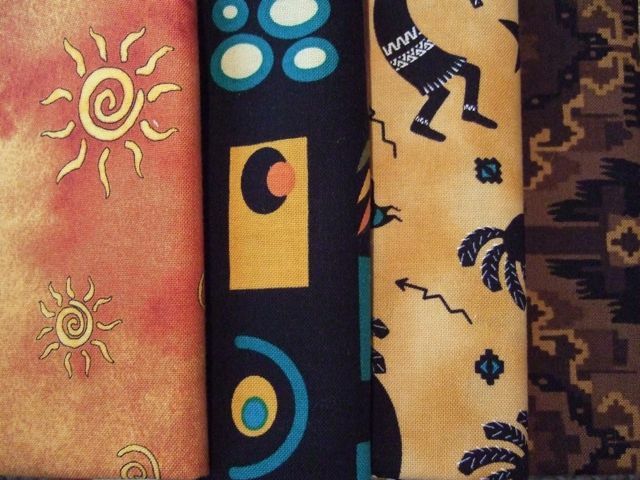 On the way home we stopped in a cute little quilt store that was moments away from closing to pick up, among other things, my four Arizona fabrics. Aren't they great? 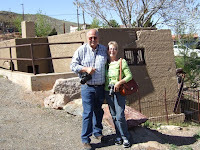 Thanks, Jim and Ellie for a great day in Jerome. We look forward to seeing you down the road. 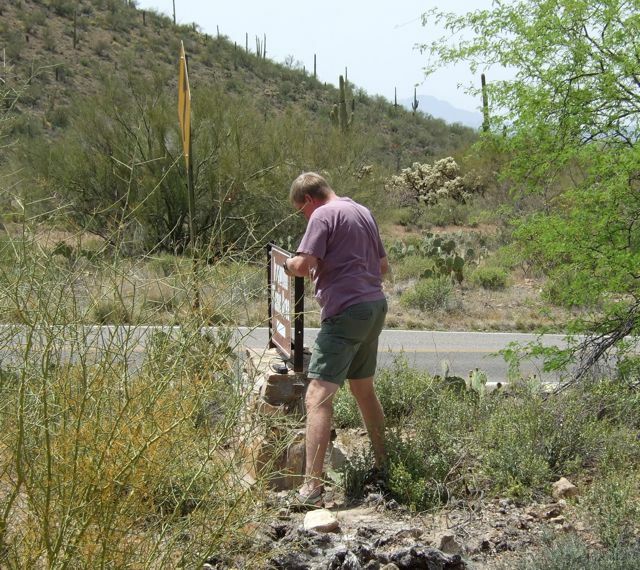 One of the great things about staying here at Camp Verde is we are within driving distance of spectacular sights in all directions. 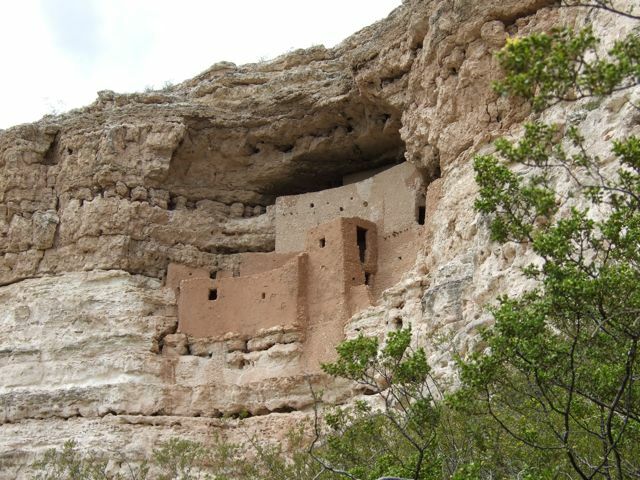 One of the "don't miss" things in the area is a trio of National Monuments that are tributes to the Sinagua people: Tuzigoot, Montezuma Castle and Montezuma Well. Tuzigoot (Try saying that Apache word for "crooked water" three times fast!) 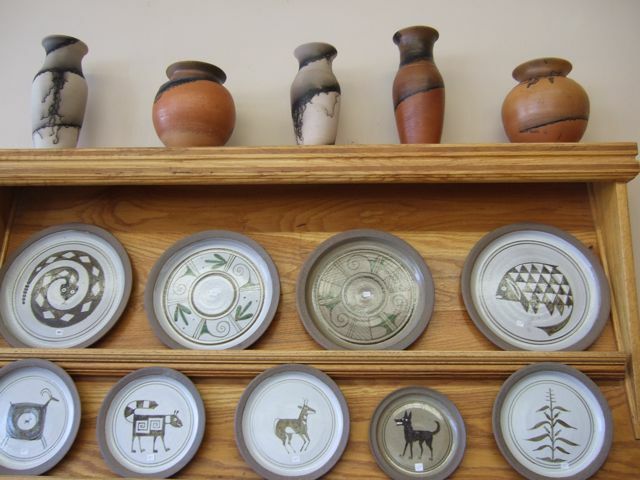 is an ancient pueblo that sits high on a hilltop near Clarksdale. On our sightseeing day with Sandie and Jim we climbed the hill overlooking the beautiful Verde Valley and checked out the site of this 1,000 year old ruin. Excavated in the mid-1930s, Tuzigoot is estimated to have been a two-story village constructed of limestone and sandstone. 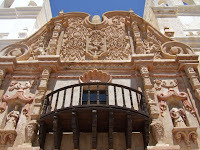 With 77 rooms on the ground floor, the pueblo was home to between 50 and 200 people. With a sweeping view and access to water nearby, this was a choice location to build a home in the desert. 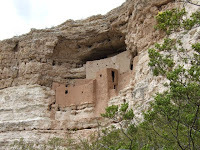 Not far from our park here in Camp Verde stands Montezuma Castle, a five-story, 20-room dwelling built in a cliff recess 100 feet above the valley floor and Beaver Creek. Its name comes from the mistaken belief that the castle had been constructed by Aztec refugees for their emperor. Truth is, Montezuma never ventured this far north. But, the name stuck. Unlike Tuzigoot, which deteriorated in the desert wind and sun, this 900-year-old place remains relatively well-preserved in its natural shelter from the elements. The 35 or so people who called the castle home used tall narrow wooden ladders to gain access to this secure spot with a view. 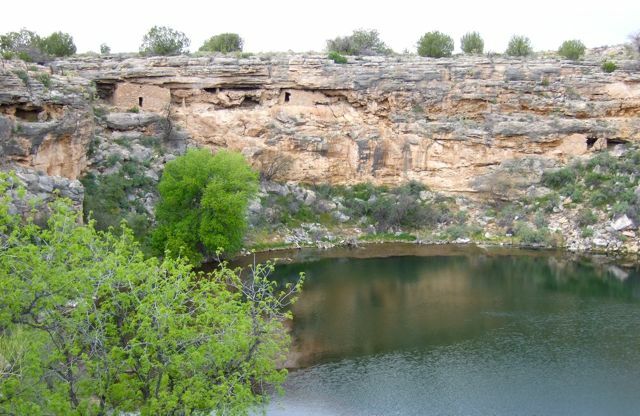 North of the castle, just east of I-17, you'll find Montezuma Well. It's a limestone sink hole formed centuries ago by the collapse of an underground cavern. 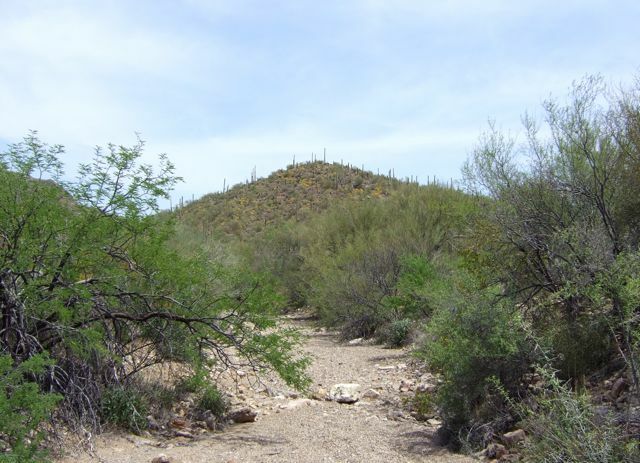 Fed by continuously flowing springs, the well supplied crop irrigation to the Sinagua. There are ruins in the walls above the water and the grounds around the well. 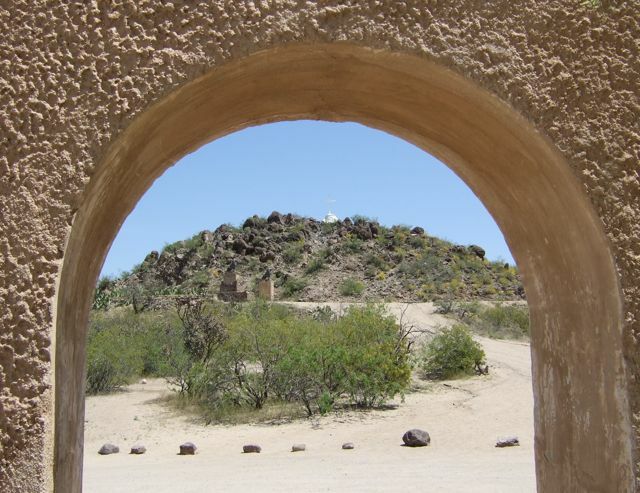 According to the National Park Service, about 150 to 200 Southern Sinagua people lived here before they mysteriously left. 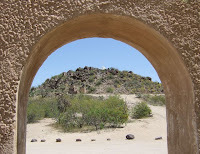 The mystery these three monuments share is what happened in the early 1400s. 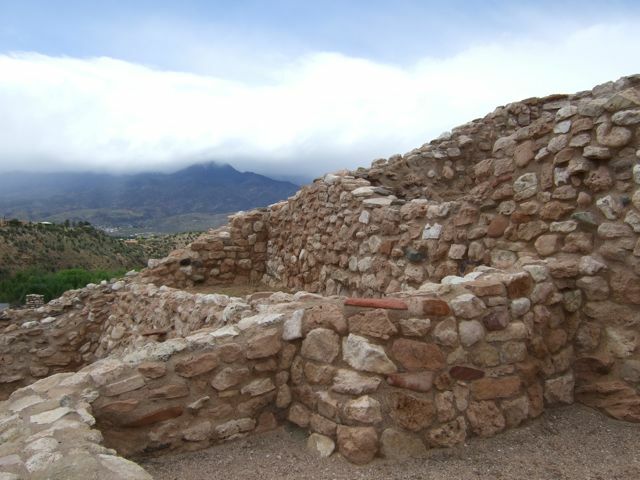 With the turn of that century, the Sinagua people abandoned their pueblos. And, as the story goes, no one knows why. Whatever the case, the chance to take a peek today at what remains of their prehistoric lives is a real treat. After a couple of back to back travel days, we were ready to just kick back and relax at our park today. 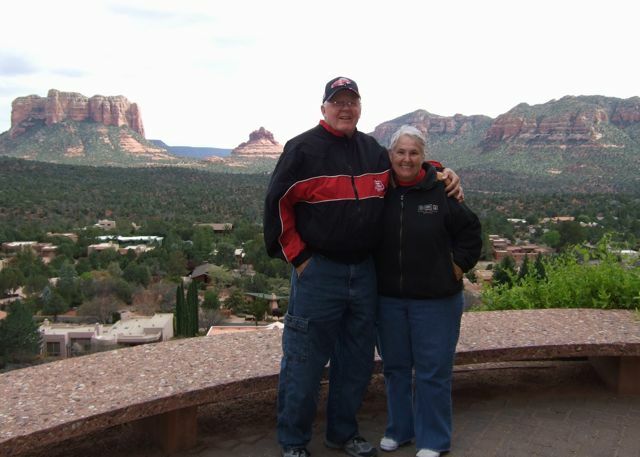 Then, Sandie and Jim called and invited us to go for a ride with them to see some of the sights. We just couldn't turn them down! 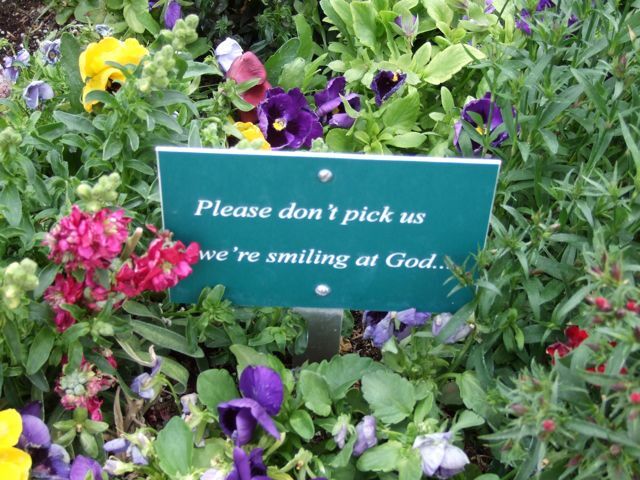 And, we're so glad we didn't. 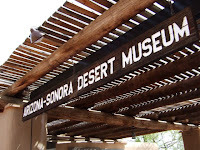 After a quick tour of the campgrounds at Dead Horse State Park (which we highly recommend and will choose the next time we pass this way) and a stop at Tuzigoot National Monument (more on that in another post), we headed for Sedona. 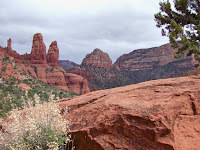 The only other time we've been to Sedona was a day trip we made years ago from Phoenix. On that day, the town was enshrouded in low-hanging clouds and we didn't get a peek at the red rocks we'd heard so much about. Today's weather featured off-and-on showers and lots of clouds. We worried that our Sedona curse had stayed with us. 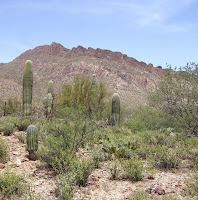 But, as we approached the town, the brilliant red rock canyons came into view in the distance. 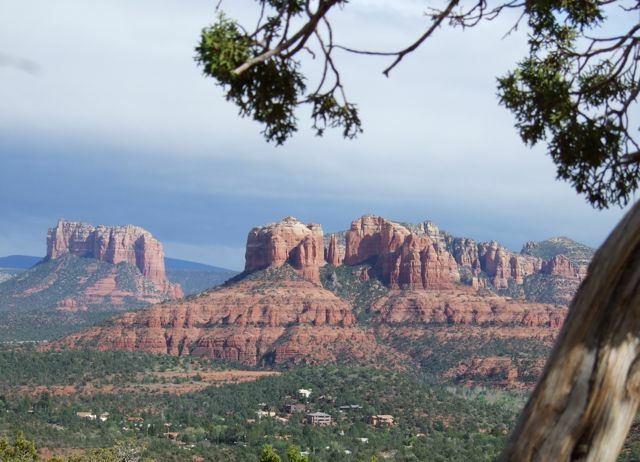 Today would be our day to finally, actually see Sedona. 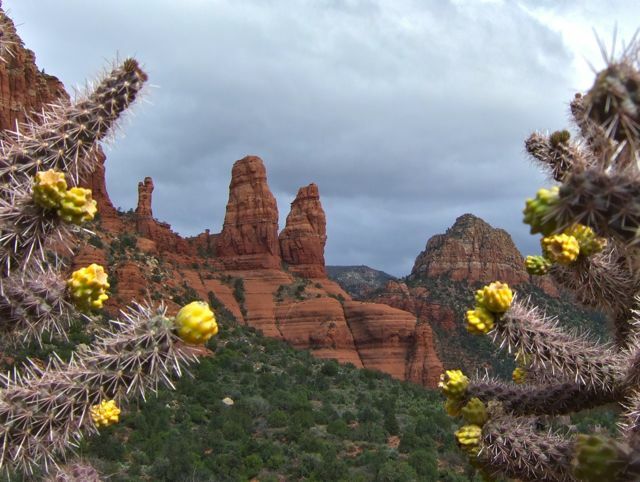 Besides being a stunningly beautiful area, Sedona is considered by many as a "vortex site". 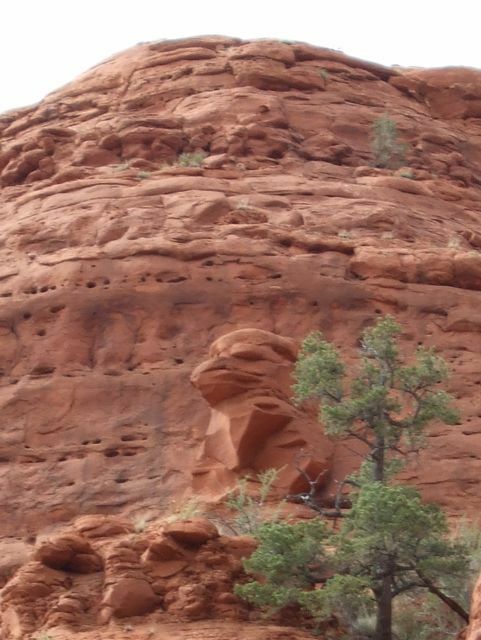 Cathedral Rock is one of several vortexes in the area, and is said to possess extremely powerful energy. Whatever the case, we can attest that is beautiful. The towering sandstone towers surrounding Sedona get there signature red color from iron. Over millions of years, as water containing dissolved iron has passed through the sandstone, some of the iron has been left behind. 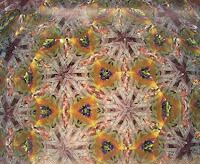 The remaining iron oxide has coated the grains of quarts and given it color. A highlight of our Sedona tour was a stop at the majestic Chapel of the Holy Cross. 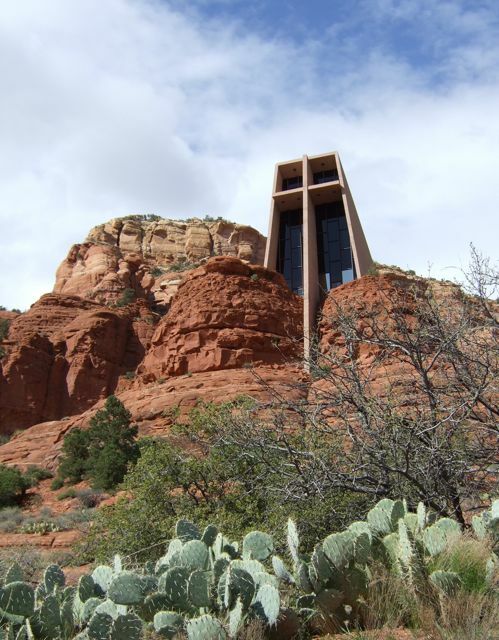 Built in 1956, this striking structure was designed by Margeurite Brunswig Staude, a student of Frank Lloyd Wright. It is lovingly maintained today by St. John Vianney parish. 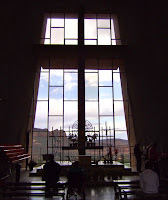 The centerpiece of the chapel is its 90-foot cross that rises between the rocks. The chapel is located in a "complex vortex" area, which may explain why so many are drawn to step inside for some time in quiet prayer or meditation. Or, it could be the magnificent view through the windows. Whatever the source, it's a very spiritual place. Here are our tour directors, Jim and Sandie, enjoying the view from the chapel. Here's one small reminder that this is a special place. 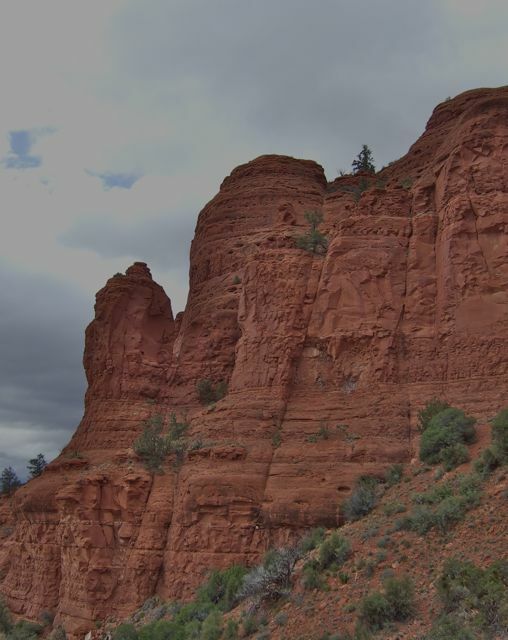 The chapel is surrounded by towering red cliffs. If you look closely in the center near the top of this photo you'll see an addition to this vortex area that's easy to miss. Here's a closer look at the carved bird guarding the chapel. One more look before leaving the chapel grounds. 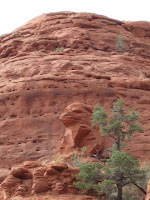 We wrapped up our scenic tour with a drive along narrow, winding and sometimes pavement-free Red Rock Loop Road. Simply magnificent! We're so grateful to Jim and Sandie for getting us off our duffs and to the rocks on this gorgeous day. Thanks, you two! 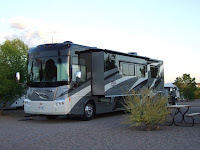 We spent the last 24 hours or so parked in this not-so-scenic spot: Affinity RV here in PRESS-kit, Arizona. 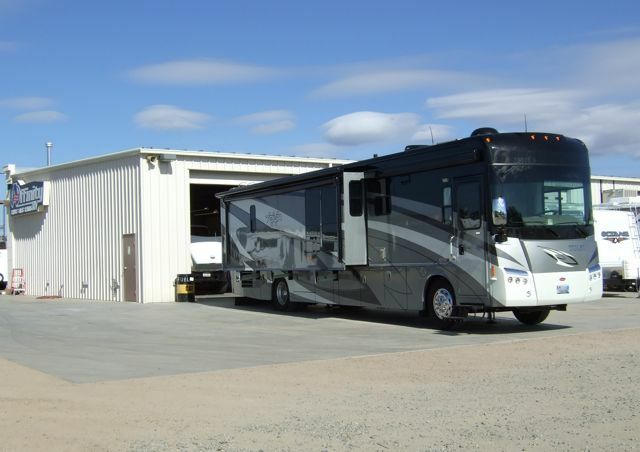 The fine folks at Affinity offered us a place to overnight and early this morning they got going on silencing Bullwinkle's squealing water heater and upgrading the software for the moose's big diesel engine. Seated at the bar, we enjoyed some fine Arizona brew and a round of the house trivia game, which was lots of fun. We followed a recommendation of one of our bar mates and strolled over to Prescott Brewing Company for a delicious dinner. 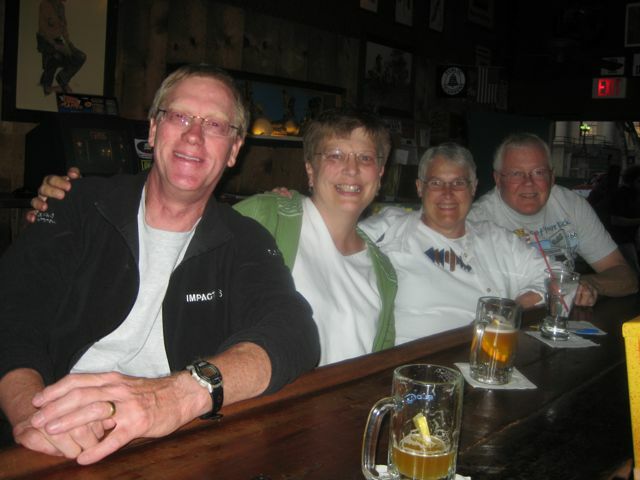 Thanks, Jim and Sandie, for showing us such a good time and sharing your pics! Our service work wrapped up around 4:00 pm this afternoon. 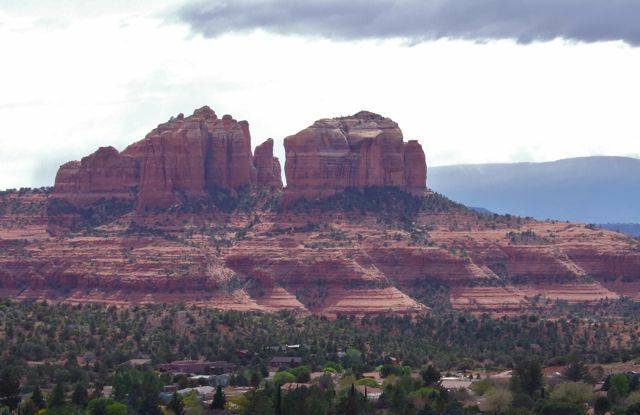 We made the short but scenic 50-mile drive up to Camp Verde, which will serve as our base as we explore Sedona and surrounding areas for the next week. With desert sunshine and a forecasted high temperature of 90 degrees, we decided to stay close to home today and explore Tucson Mountain Park, a 20,000 acre preserve about 15 miles west of Tucson. This was our second visit to the park. Our visit was three-fold. First, we were there to take pictures. (My camera lost its charge on our first visit.) 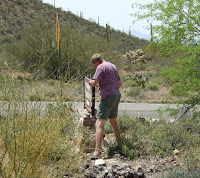 Second, we wanted to pick up a few more geocaches in this beautiful area. This shot was near our first find, which was not too far from the south entrance to the park. 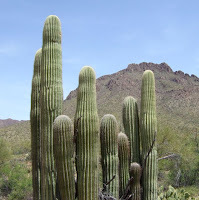 While Paul searched for our second cache of the day, I was distracted by this stand of very orderly saguaros. 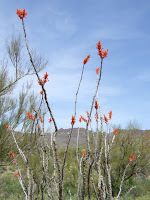 I love these towering ocotillos. They look like bright red paintbrushes sticking out of the ground. 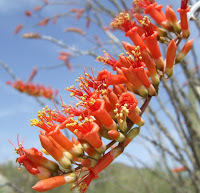 Here's a close-up of the ocotillo flower. 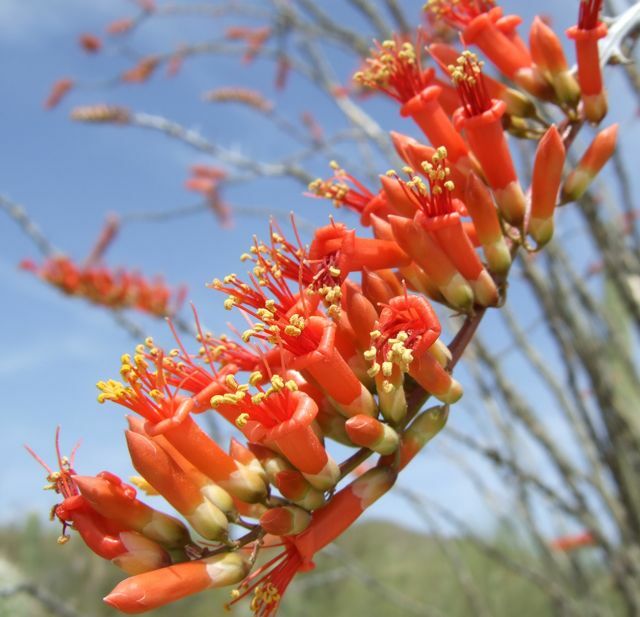 This desert plant typically blooms from April to June. They are absolutely beautiful this year. I focused my attention back to the task at hand. There's Paul locating our second cache of the day. The journey to our third cache location took us on a bit of a hike. 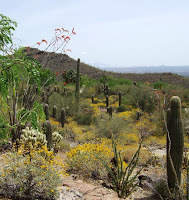 Crossing this dry river bed, we reminded ourselves that we are, indeed, in the desert. 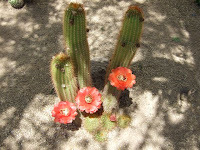 And, the desert is home to lots of creatures to be careful around. 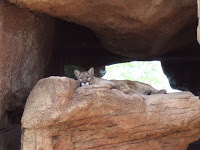 Sure enough, as we closed in on the cache location, we saw one of these creatures guarding the find. It was a Mohave Rattlesnake! These two desert cachers made a hasty retreat, crossing the dry river bed and hopping back into the safe confines of our Jeep. And, no. This isn't the actual snake. (Like either of us was going to stop and take a picture!) One of us decided we were done caching for the day. (Can you blame me?) 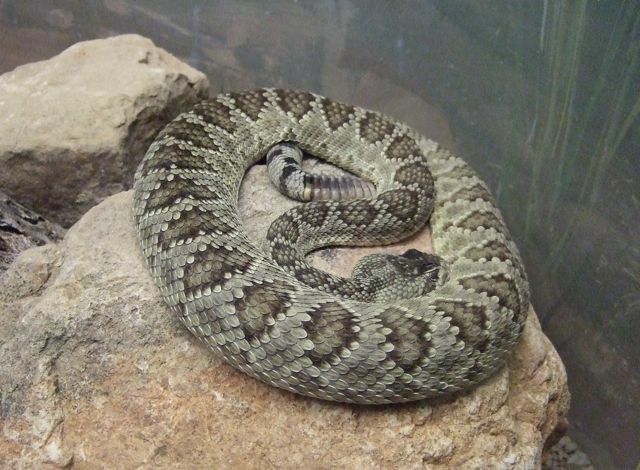 So, we headed for the nearby Arizona-Sonora Desert Museum where we snapped a photo of this highly venomous look-a-like on display. A visit to the museum was the third reason for today's trip to the park. 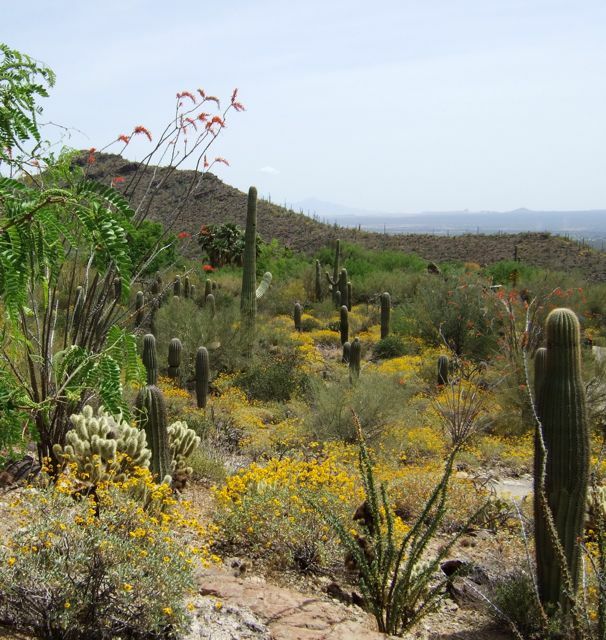 The 21-acre facility, located inside Tucson Mountain Park, is a world-renowned zoo, botanical garden and natural history museum. 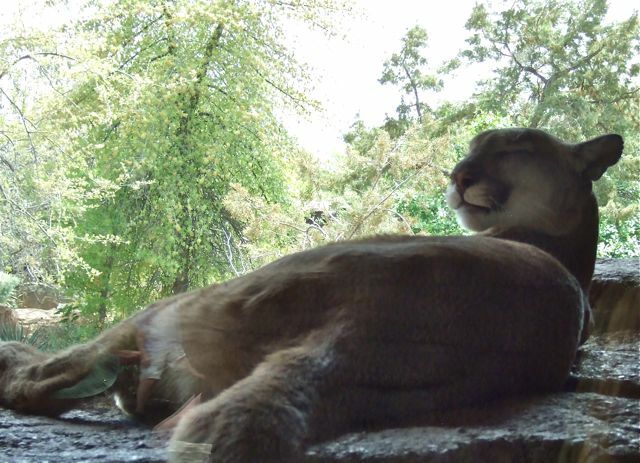 This is as close as we have ever been, and ever want to be be, to a mountain lion. Thankfully, there was a big plate of glass between us and this grooming cat. Here's the big kitty from the other side. 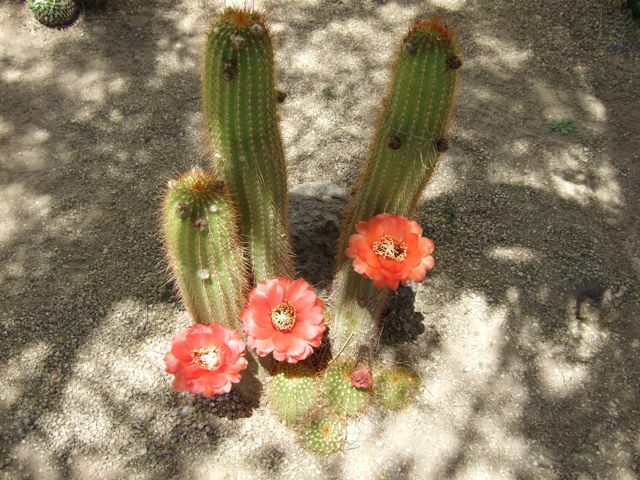 The botanical garden lets visitors get up close and personal with the Sonoran Desert. 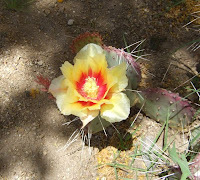 I just had to get a close-up of this flowering cactus. 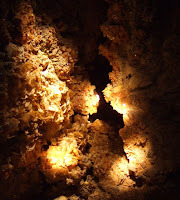 As we strolled through the museum's "cave", we spotted this very sparkly exhibit of wulfenite and mimetite. Between the heat of the afternoon and the off-the-charts pollen count in the blooming desert, we cut our visit short and headed back to the moose. 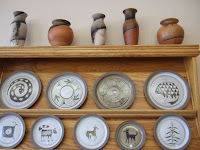 Although we only saw about half of the exhibits, we highly recommend a visit to the museum for anyone passing this way. With more to see, we look forward to coming back next winter. One of the things I've been trying to photograph while we're here is a Tucson sunset. And, so far, I just haven't been in the right place at the right time with a camera to get a nice shot. Last night, though, I saw this and quickly grabbed the camera. 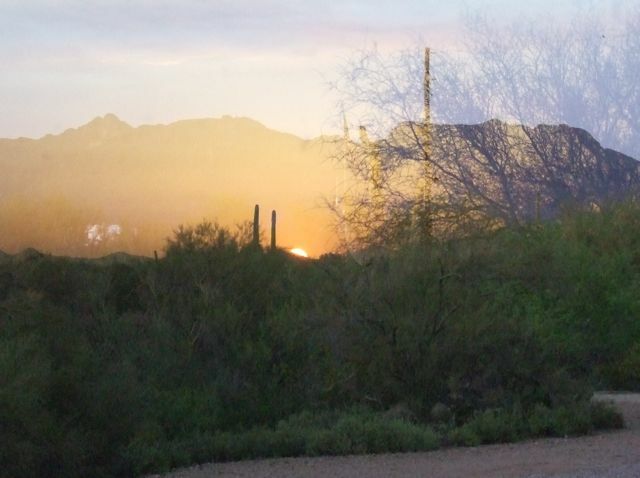 It's the view to the north, with the Tucson Mountains in the background and a reflection of the setting sun in the west, as seen in the reflection of our big, curved windshield. Cool, huh? 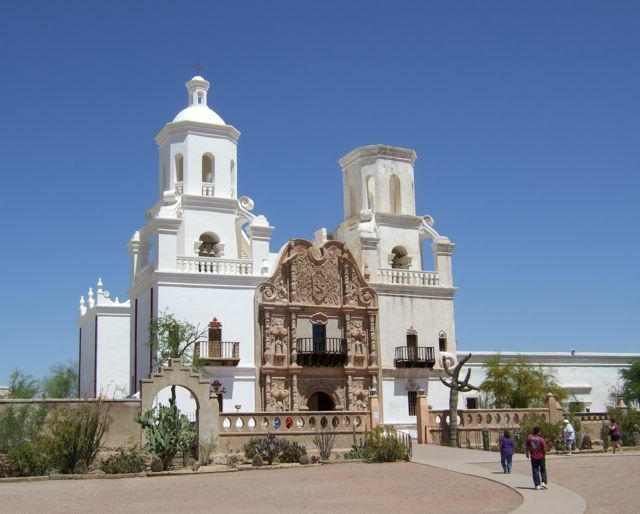 We took advantage of one of Tucson's 300 sunny days this year to drive south a few miles to visit Mission San Xavier del Bac. This shining white mission shimmers in the desert sun. 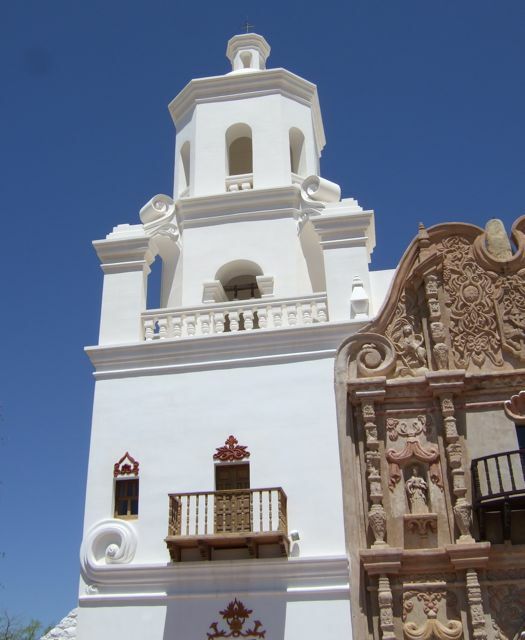 It's striking appearance against the barren sandy soil and clear blue sky has earned this national historic landmark the nickname "White Dove of the Desert". 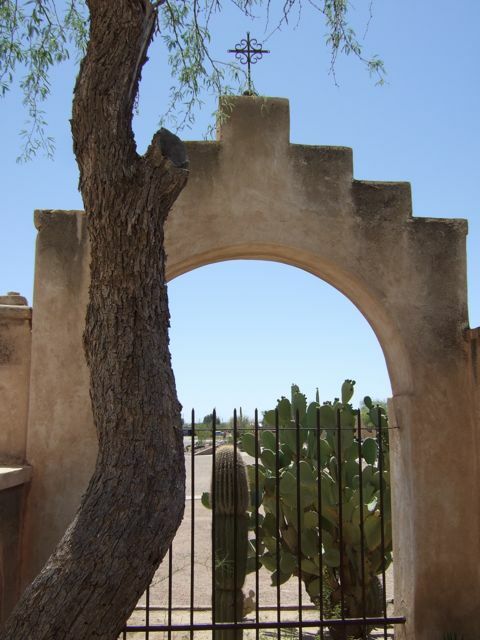 The mission is one of 24 missions established by Jesuit missionary Padre Eusebio Francisco Kino in the late 1600's. His vision for the church was simple: Impress the Indians. Our guess is that mission was accomplished! 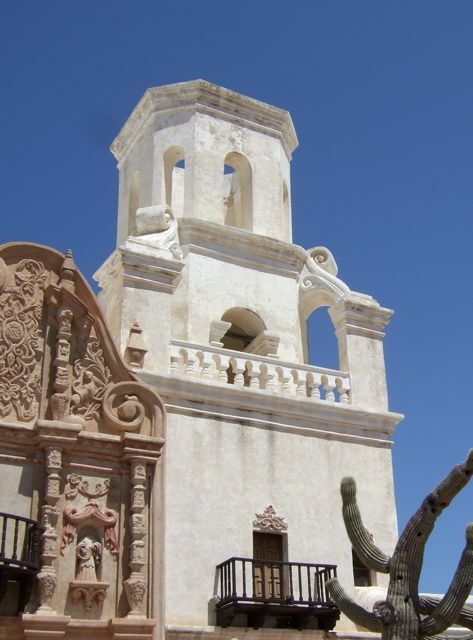 Completed in 1797, the mission is in a constant state of restoration. 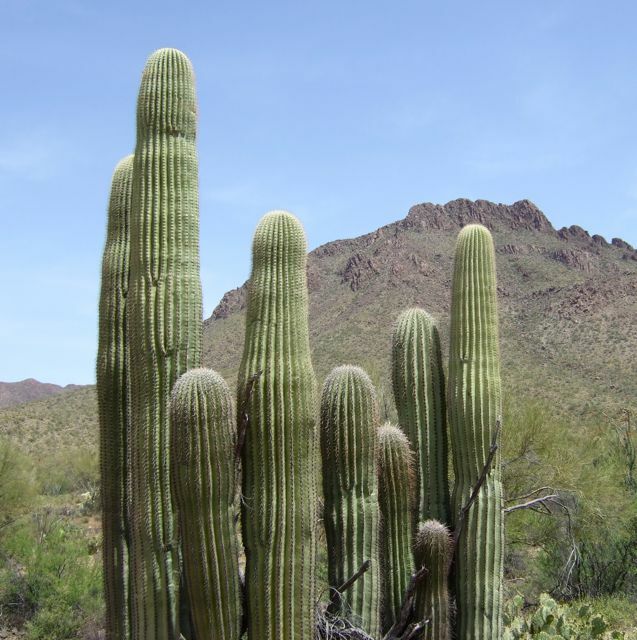 Standing in the blazing Arizona sun for 213 years has definitely taken its toll. 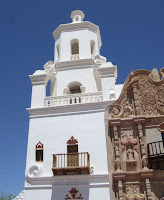 The west tower has been restored to its original splendor. The east tower, which was never completed in the original construction, has yet to be restored. 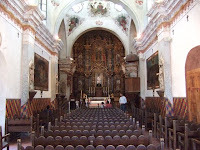 Very little is known about the construction of this magnificent church. 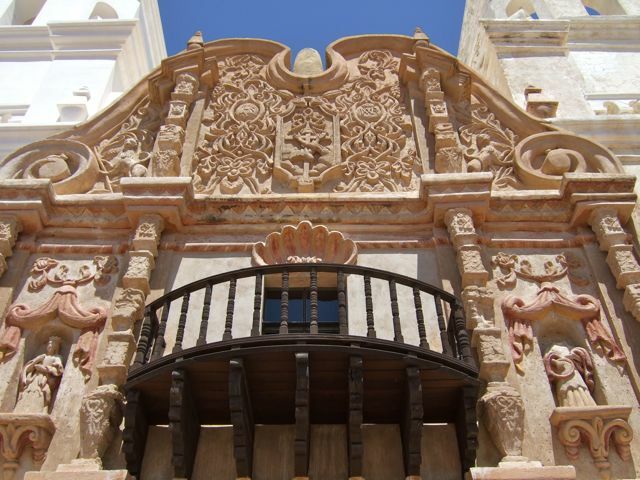 The names of the original architects and artisans have been lost in history. 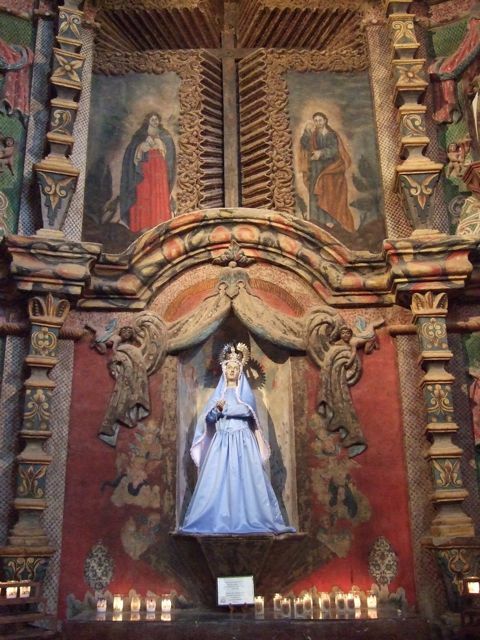 Also known as "The Sistine Chapel of the New World", the interior of the church is filled with painted murals, carvings and sculptures. 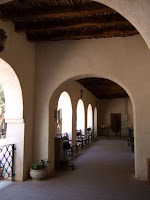 The mission is an active Catholic church that serves the Tohono O'odham Indian tribe. 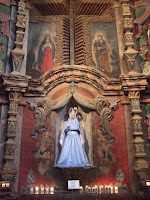 The statues, carvings and paintings surrounding this side altar are beautiful. The interior of the church was restored in the 1980's and '90s by a team of conservators from around the world. 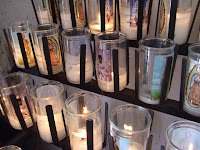 The mission serves as a shrine to St. Francis Xavier and is a place where many Catholics come to make requests to God. Each of the hundreds of lighted candles here represent a person's vow, intention or prayer. 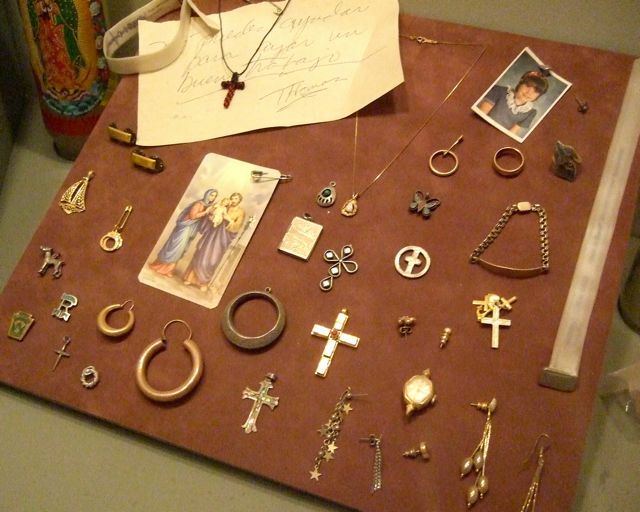 Other visitors leave "milagros", small cast-metal ornaments, as offerings for their devotions. This display of offerings includes several pieces of small jewelry, a holy card and a handwritten note. The note, scribbled in Spanish, is a prayer from Thomas for help to find a good job. The arch is a predominant architectural element throughout the mission. This arch opens to Grotto Hill on the east side of the mission. A cactus garden sits outside a small chapel on the mission grounds. Lucky for us, the desert is in bloom this time of year! 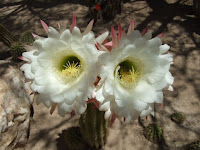 If there's an Easter Lily cactus, this is it! 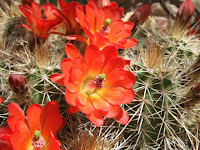 It's a first for us to see so much color in the desert. 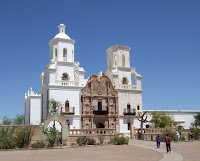 The mission sits on Tohono O'odham Indian Reservation. 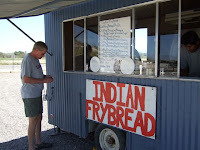 Just steps away you can find local vendors with native crafts and foods for sale. Without having a clue what it was, we decided to try the Indian frybread. 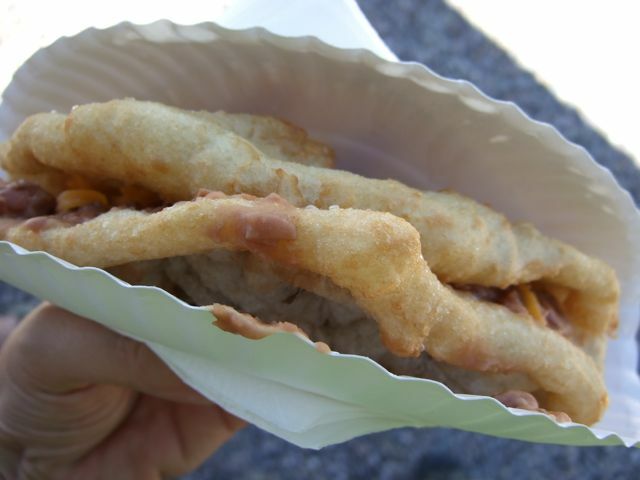 Take a tortilla and deep fry it. Fill it with, in our case, beans and cheese and fold it up. That's frybread! And, guess what? It's mighty tasty!